The dependency process for Project Management can now be customized to your business days and company holidays in Company Setup. A Company Admin can shift their company's tasks and milestones around, based on these set days. To get started, navigate to Company Setup > Configuration Options > Business Days and Holidays. Company Holidays: Add any number of company observed holidays by selecting Add Date. Company Holidays can be removed by selecting Remove alongside the listed holiday. By clicking Add Date, you can add and specify any number of observed holidays or dates of non-operation for your company. The 'Notify Assignees of a Task/Milestone when its predecessor is complete' setting will send notifications to assignees of dependent tasks or milestones. After you have selected your business days and company holidays, the next step is to create a milestone. After a milestone is created, you can then create dependent milestones, tasklists and tasks. When editing the due date of a milestone that has one or multiple dependent tasks or milestones you have the option to edit your milestone and move the due date forward or backward, which will then generate a checkbox asking whether or not you would like to shift dependent tasks, milestones, or both by a set number or business or calendar days. 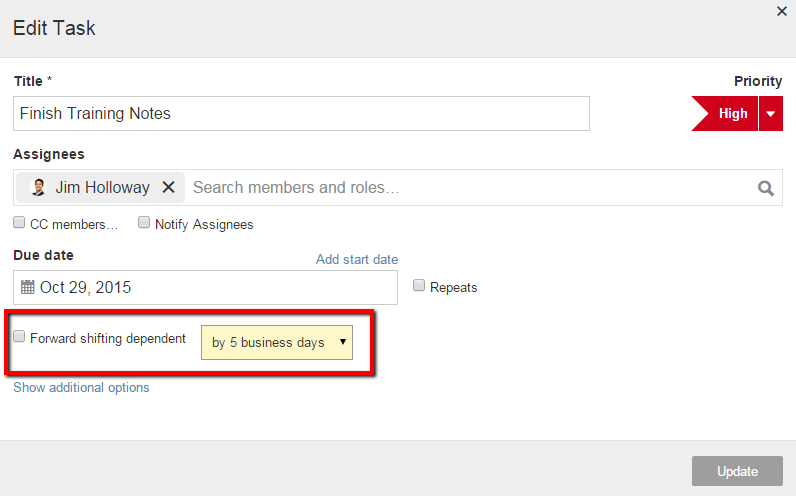 When selecting, “by # business days” from the drop down menu this will list the number of days you can move your dependent tasks or milestone forward or backward not including non-business days (such as weekends or holidays listed in your company setup > configuration page). 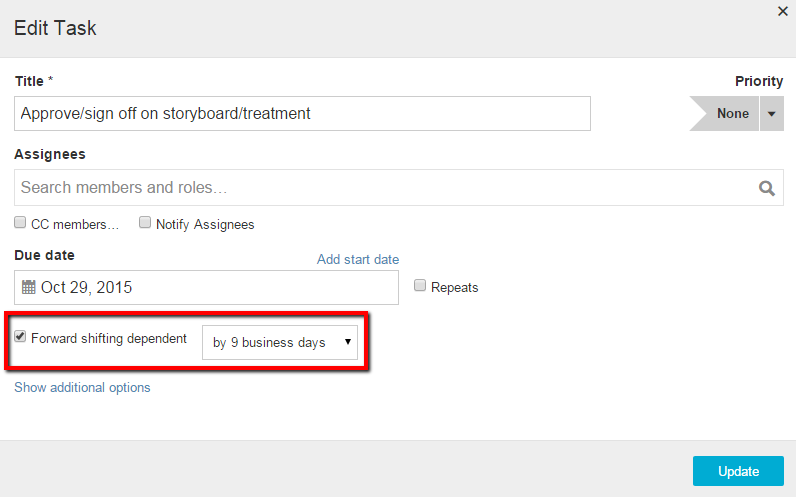 Alternatively, when selecting, “By # calendar days” from the drop down menu this will list the number of days you can move your dependent tasks or milestones forward or backward including non-business days (such as weekends or holidays listed in your company setup > configuration page). Tasks can be linked to other tasks which reside in different task lists and/or milestones. When tasks are linked, one task is considered the predecessor and the other is considered the dependent task. This allows dates of the dependent task to shift accordingly if dates for the predecessor is changed. To set a task as dependent on another task, click on a task's name in any task list view to see the details of the task. Next, click on the "Edit" button to edit the task. From the edit view, locate the "Depends on" field (in the "Show additional options" section) and begin typing the name of the predecessor task. Tasks that match the input will appear in a list below along with the name of the Task List to which they belong. Click on the task name to set it as the predecessor. Click Update to save changes. When editing the start or due date for a predecessor task, the user will be prompted whether the date(s) change should shift dependent tasks. 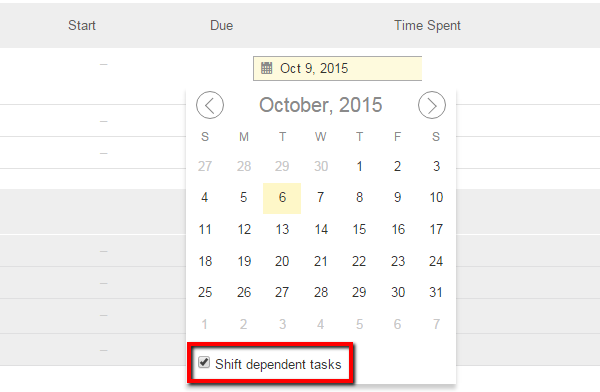 To shift dependent tasks, click the check box and select whether to shift the dates by either calendar days or business days. Click Update to save changes. When editing the start or due date for a predecessor task, the user will be prompted whether the change should affect dependent tasks. Moving the date back will ask if you'd like to "Backward" shift, and moving the date forward will ask to "Forward" shift dependent tasks. To shift dependent tasks, click the check box. This will shift the date(s) of the dependent task by an equal number of either business days or calendar days as determined by the drop-down menu. The difference between business and calendar days is the number of company non-working days and holidays covered by the shift. Click-to-Edit from a tasklist, enables you to quickly edit the dates and shift dependent tasks. By editing the primary task, the dependent tasks will automatically shift the designated number of business days forward or backward. The shifting of start dates and due dates is independent of each other; modifying the start date will not shift the due date and vice versa. When Skip Non Working Days is selected while editing the Gantt Chart, task duration will not include days that are designated non-working days in Company Setup. In the example below, a task which spans across the the non-working weekend will not include Saturday and Sunday in its total number of days. Also, tasks which are moved onto a non-working day will be automatically moved onto days when the company is considered open for business. Note: Only incomplete tasks and milestones can be edited from within the Gantt chart.